Gershwin’s Rhapsody in Blue was a smashing success, even though many musicians and critics were aware of its composer’s inexperience writing more substantial orchestral works. So what might its warm reception be attributed to? More often than not, context is everything. . .
Rhapsody in Blue has been memorialized as the piece in which George Gershwin broke the mold by merging popular idioms with an exploration of art music’s longer and more substantial form. What many don’t realize, however, is that his premiere’s considerable success may have largely been thanks to its timing, for when should Rhapsody in Blue have been first performed but a mere two weeks after Igor Stravinsky’s Rite of Spring made its New York debut! The Rite of Spring may be a modernist musical icon, but its first American audiences, like those at its Parisian premiere, reacted to the work with significant distaste. By the time both Stravinsky’s and Gershwin’s pieces had been heard in the city, critics began to draw sharp contrasts between them. 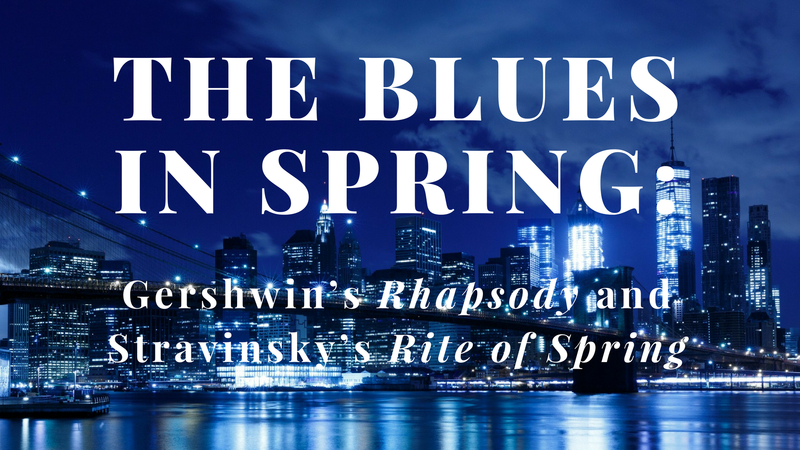 Some disliked both, but many viewed Stravinsky’s Rite of Spring as yet another poor and unpalatable attempt to create modern music, while they praised Gershwin’s Rhapsody in Blue as an appropriate, engaging, and particularly American musical work. In fact, some, such as conductor Willem Mengelberg, went so far as to reportedly say that “Gershwin had succeeded in doing what Stravinsky was trying to do.” Rhapsody’s timely juxtaposition with Stravinsky’s more avant-garde composition certainly seems to have worked in Gershwin’s favor, propelling his career as a serious composer full steam ahead! Oja, Carol J. “Gershwin and American Modernists of the 1920s.” The Musical Quarterly, 78, vol. 4 (Winter 1994): 646-668.